You are here: Home » How To Guides » Old A1WebStats System Guides » How to see companies that follow patterns of interest to you (e.g. more than 1 page, visiting a certain page). How to see companies that follow patterns of interest to you (e.g. more than 1 page, visiting a certain page). If you don’t have a lot of identifiable companies in your data then the daily reports are probably enough for you. 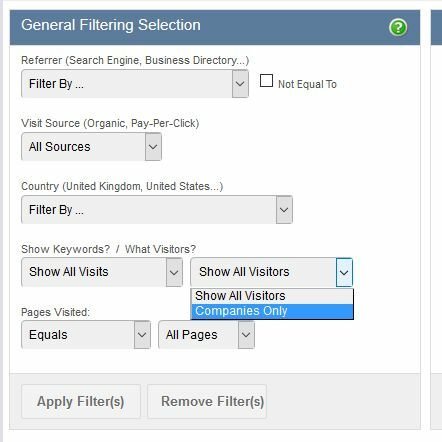 However, if you have a lot of data or are interested in a specific type of company visitor pattern, then this guide will help you. 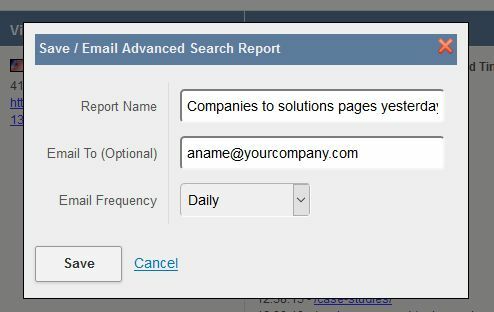 For example, you may want to receive a daily report that shows you identifiable companies that viewed more than the one page they landed on, and looked at a certain section of the website. 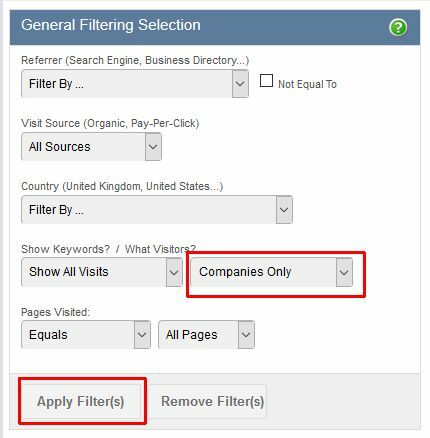 Within the General Filtering Selection part of the page, in the fourth row down, change ‘Show All Visitors’ so that it says ‘Companies Only’. To add another filter to the one already chosen, scroll up the page to the ‘Visited Page Options’ section. Click into the box titled ‘Any Visited Page 1’ and enter /solutions (this will pick up visitors who got to any of urls that had /solutions in them, which includes all sub-pages). Click on the Apply Filter(s) button and you will be taken to the bottom of the screen where you will see a line of ‘Total Visitor Records’, showing you the number of records that have been extracted below, covering that date range you chose. 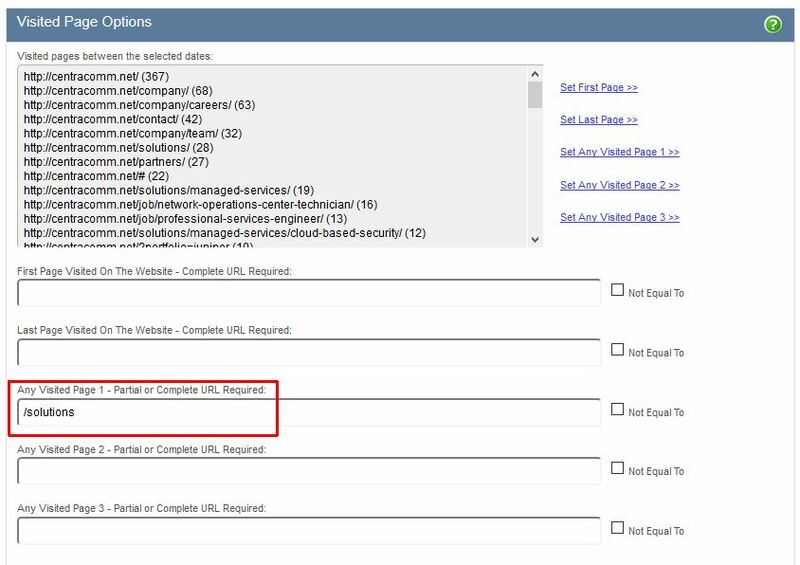 In this example there’s now data showing visitors from identifiable companies that got to any of the pages with /solutions in the url (during the date range we specified). 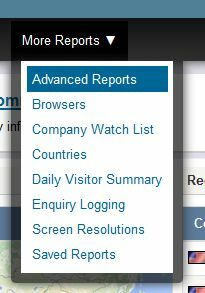 With that report generated you may then want to email the report to someone and so can click on the ‘View Report’ link at the top of the page. You can now copy the url from the top of the browser and email it to anyone that wants to click on the link and see the data. 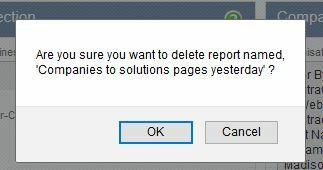 Create a name for the report (that’s meaningful). 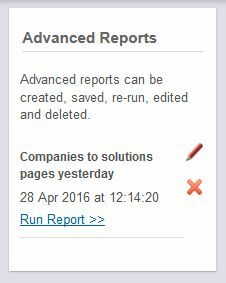 For example ‘Companies to solutions pages yesterday’. This is the name of the report that will appear in the email inbox of the recipient each time it runs. Select the email frequency. Most reports are run daily, and weekly covers the past 7 days. 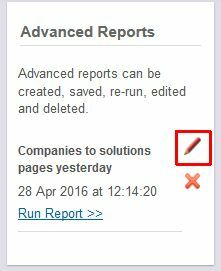 Each report will run each day/week/month if the parameters that you created are matched. It will then email the report to the recipients. If the parameters aren’t matched then the report doesn’t run.